Multi-purpose Rotating Bench Vise. Parallel Jaws. Head swival 360 degree. Full 360 degree rotational jaws. Unique "V" jaws provide 4 point holding power.Sizes: 4" & 6"
We are a prominent name in manufacturing and supplying of Rotary Head Vice. 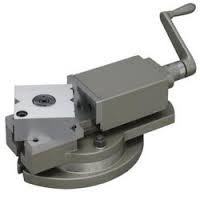 Round vice 3" is suitable for our small rotary tables 75mm / 100mm sizes. Excellent precise compact design, designed especially with rotary tables. Supplied with table fixing bolts. Its Jaw opening is 30mm. Jaw width 54mm. Jaw height 20mm. Vice has horizontal and vertical vee in moving jaw. Technical Specifications SVCMRF2080 Salient Features Power Required 230 V/ 1 Ph/ 0.5 kW Flameproof Main Motor Air Required 5 - 10 CFM @ 2 - 3 Kg Bar Speed Variable Via VFD Production Capacity 20 - 40 BPM Depending On Volume 15 Mins. Changeover Time Approx. Dim. (LxWxH Mtrs.) 0.8 x 0.8 x 1.9 Flow Regulator Filling Speed Approx. Jaws can be changed bysimple rotation of the Rotary head & fixed in position using 2 hex bolts. 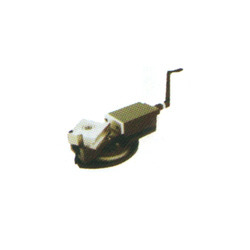 Rotary head design removes any chances of inaccuracy, which are common if jaws are replaced.